Summer is approaching, I can feel it! We end on the 26th here in NY, although I do see some of you lucky ducks have ended already, or end soon! In preparation for this extended period of non-speech for our kiddos, I've crafted a little packet to avoid the "speech slump". So far, I have a calendar for /s/ and /r/ in all positions, and one for basic language. 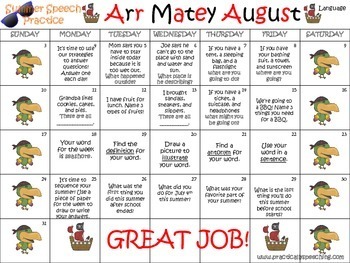 The articulation calendars are for July and August and give a set of weekly words for July and daily words in August. 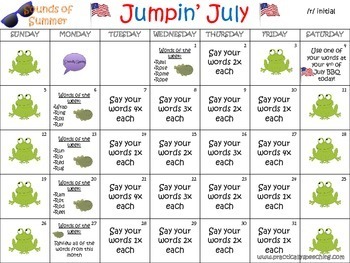 You can layer the calendars you want to send if your kiddos have multiple position targets. It also comes with blank calendars to fill in your own directions, or maybe have students keep track of the days they complete without totally scratching out the words to remember! The packets also all come with a letter to send home to parents. It's addressed to the "Speech Helper" in order to cover any and all people who work with our kiddos on getting in their practice! The letter basically explains why we want them to practice over the summer, and gives a brief review of what to do with the attached calendars. The calendars themselves are fairly self-explanatory, but if you know your parents need a bit more instruction feel free to add it in! 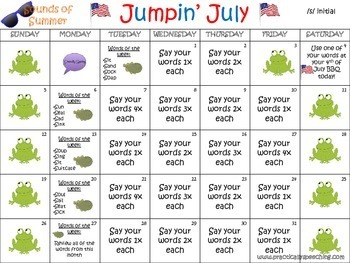 The language calendar targets vocabulary, inferencing, comprehension questions, sequencing, and categorizing. It's a little different than the articulation just in the way it's worded, but the format is the same. The themes are the same too! You can download the /r/ calendar for free for a limited time as a trial on TpT! Click below for the links to the different calendars!